After checking out of our Walmart parking lot accommodations we set the GPS for the closest Rest Area and Starbucks. After departing home after work the previous night, we made it as far as Cottage Grove in central Oregon before our eyelids could not handle the traffic and rain anymore. We began to wonder about a ‘spring vacation in California’ as we passed a blanket of snow from Ashland to almost Redding. The weather broke a little in Redding, so we pulled our bicycles out of the van and checked out the Sacramento River Trail. It was great! 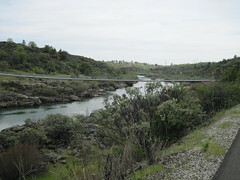 A paved trail follows the river on both sides, beginning at Sundial Bridge and continuing to the dam. It was a delight to enjoy a little sunshine and the budding trees along the river. Once out of the downtown area, the trail had little traffic and we cruised along the smooth pavement. After the bike ride we headed south and then west when we got to Williams. We crossed the coastal mountains and passed by Clear Lake to catch US 101. We found a ‘real motel’ in Ukiah and enjoyed a shower and clean bed. We'll be seeing you when the sun starts shining :-) Ellen says to call her if you want the key.